Valentine's Day gift from my very sweet husband who went shopping at Britex Fabrics on his lunch break! I love those hippos! Johnnie spent three days working hard on these Valentines for his classmates and friends. He put so much attention in to each detail. On the day of the school Valentine party when I picked him up he showed me that he still had all his Valentines in his bag. He had been too shy to raise his hand and tell his teacher that he hadn't got a turn to pass his out. It just about broke my heart, but we quickly ran around to all his friends before they left to go home and I think most everyone got one. I'm busy making pillowcases for birthday party gifts this weekend. I'm starting on a fun quilt project too. Since we are not busy cooking this morning we decided to make some turkey placecards to bring along with us to Thanksgiving dinner. What a fun Halloween! We went out this afternoon to trick-or-treat at the downtown shops. It's a little less scary than going out at night and it was really fun for the kids. Johnnie was a green dragon, he thought his costume was really scary--it was so cute. I had big plans to make Johnnie his costume this year and he wanted to be a dragon. And then a month or so ago I got an email from Old Navy showing off their Halloween costumes with this green dragon for $22.50. How can you pass that up? Its made of fleece and is really warm which worked out great because it was pretty rainy this afternoon. My little guy is 4! I can't believe it. I haven't wrote here about him starting preschool last month but he is doing great and just can't believe how grown up he is getting. I rented this kids table from the local rental place and it was the best 20 bucks we spent. There were 10 kids attending and this gave everyone a place to sit and enjoy lunch and cake. We had fun decorating with cut out paper fours and confetti. My husband printed out a photo of each child with their name on it and we put it at their place setting. This felt banner is from Target. I had planned to make one but for $12.99 I couldn't pass it up. I did make 12 yards of bunting using all my red/blue/green/yellow fabric scraps. I got a bee in my bonnet last week and made this in one late night crafting adventure. I had so much fun making this and it reminded me how much I love to work with felt. I was so excited with it when it was finished that I went in to Johnnie's room and put it on his sleeping head. He loved it when he saw it but after wearing it on his head for about 10 minutes he announced that it made his head sweaty and he wondered it I could make him another one that wasn't so sweaty! He did indulge me though and put it on his head again several times throughout the party. You can just see a bit of the "four" t-shirt that I made him for the party in this photo. He wanted to have "fire truck, monster truck party with roundy curl finds and piston cups". We have no idea what "roundy curl finds" are and he didn't either but he insisted that they be included in his party. So I convinced him that roundy curl finds are made of chocolate and those are the chocolate curls you see here on the cake. The "piston cup" is a reference to the movie "Cars" I am embarressed to admit. I ordered the cake with no decoration and then my Mom and I decorated the top. We sent the kids home with a cute little bag of two decorated cookies that my sister so graciously made and frosted. They were so cute. We also gave everyone a set of firetruck and monster truck stickers we printed at home. In all the excitement I forgot to take a photo of the favors. I made this little t-shirt with an appliquéd tree for a friend's first birthday. I dyed this t-shirt a while back and had saved a few for gifts. I used my machine to do the blanket stitch around the edges, I love this stitch but need to practice the corners a little more. See the small mistake in the top left corner? I added a little bird to the shoulder too. We have had the week of birthdays here, lots of celebrations and lots of crafting frantically trying to keep up with all the gifts. This is a present for our friend Estella who is turning 4 and her party is Saturday. I made some kool-aid dyed playsilks a few weeks back and now I've got some in my stash for gifts. We included a yellow and a purple tied with some bakers twine. This canvas bag was in the $1 section at Target. I bought a few of these to keep around for quick gifts. For teaching me how to fish. For playing hide and seek with me EVERY night before bed. For flying me up and down the hallway like an airplane. For playing guitar with me and singing songs about dragons, firetrucks, racecars and everything I like. For mowing the lawn together every weekend. For reading me books and letting me take pictures with your camera, answering my many, many questions. For making me the best pancakes every Saturday morning. I'm not bragging here, but we have been having some beautiful weather in Northern California. We've been spending a lot of time in the yard, pulling weeds and planting and getting ready for summer. 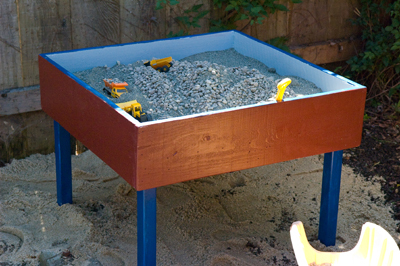 I had this idea to make my son a sand/rock table and my husband built this little table on the weekend. We found this little table out at the dumps, they have a recycled goods store out there which is so nifty. My husband added the sides and gave it a fresh coat of paint. My son is loving it! 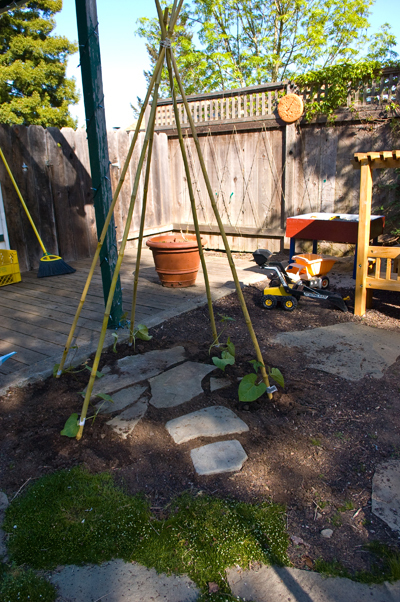 And while planting vegetables we made this green bean teepee. Maybe this will encourage my son to eat green beans? I sure hope so.